Last week we took profit on our Long Dec-Short Feb position. Below is how the weekly product market changed for the week ending 12/8/2017. The dominant news to report this week is that the product values have more than likely peaked and will be on the defensive for at least the next couple of weeks. Here is how we see the primal cuts performing the next couple of weeks. Loins and butts should trade plus or minus $3 -$5 either side of Friday’s close for the balance of the year. Ribs will not be much of a factor until after the first of the year. Bone-in Picnics, given the price level at which they are, will not move up or down to any significant degree. Swine Times believes that the bellies and hams will be the two cuts that will be impacting the pork cutout the most. We are of the opinion that the hams could lose as much as $10 cwt between now and January first. This could put them at $57-$58 by the end of the year. The bellies will also be under a considerable amount of pressure and could lose as much as $20-$25 the next couple of weeks. They closed out Friday at 142.52. As negative as these price projections are, it could be worse, particularly if the packer adds to their weekly slaughter schedules. If that happens, the potential is there for ALL of the primal cuts to go even lower. Pay attention to the USDA daily slaughters and be alert to any increases to the Saturday slaughter schedules . The USDA Interior Iowa Weight went up 1.1 lbs. at 286.9 versus 285.8 the week prior and 281.2 for the same week last year. Swine Times is raising the yellow caution flag on these weights. It appears that the weights have begun to increase at a time of year that would lead us to believe that there may be some hogs backed up. We say this because the weights this year are now 5.7 lbs. over last year. This is a concern with respect to the possibility these increases could be indicative of a backup of market ready hogs. We will continue to monitor these and relay any news as it becomes available. The futures will trade to a large degree by what the product values do and will be influenced more by the drop in ham prices and, maybe even to a greater extent, the drop in belly prices. 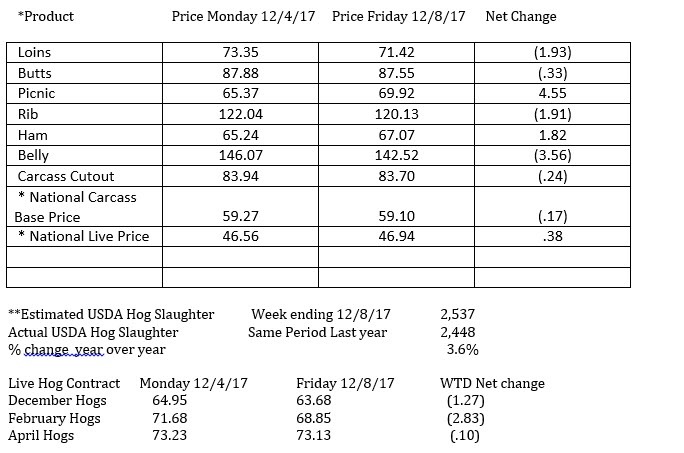 We look for the December hogs to trade within 50 cents of the cash market and expire within that range on December 14 when they go off the board at noon. February hogs should drop below $68 and possibly go down to $67. In our opinion, this will depend on how backed up the hog supply is and how much of a loss the cutout sustains between now and January first. We will be looking to get long February hogs under $67 and April hogs under $70.00 if they get there. Be patient on buying these, as there is a lot of time left. Once the industry gets the holidays behind them and some of the backlog of hogs gets cleaned up, we believe the February hogs could be good property from the long side. Export sales will not be much of a factor for the next couple of weeks, but pay attention to news of sales out front to China and Southeast Asia. Watch the weather and adjust your positions accordingly.